East meets West with this recipe modification of the San Francisco standard breakfast meal known as Joe’s Special. The Joe’s Special meal was invented in a San Fransisco Diner during the 1930’s and is a mixture of ground beef, onion, garlic, mushrooms, spinach, and eggs. We’ve switched the ground beef for lean ground turkey and added a little taste of Baltimore with Old Bay Seasoning. The results are a delicious breakfast or dinner meal. Cook the turkey in a large non-stick skillet until browned. Remove any excess fat from pan. Sprinkle the with Old Bay Seasoning, add the onions, and garlic, and cover . Let simmer about 5 minutes, then mix the onions and mushrooms into the cooked turkey. Continue to simmer and mix until the mushrooms and onions are cooked, about another 3 to 4 minutes. Top the mixture with 6 ounces of washed spinach leaves. 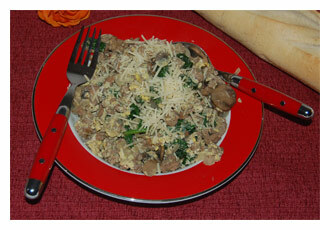 Cover, let cook for 3 to 4 minutes, then remove cover and mix the wilted spinach into the meat, mushroom and onions. Cook another few minutes to let the moisture simmer away, and then add the beaten eggs. Stir the mixture until the eggs are set. Sprinkle each serving with 1/2 – 1 tsp Parmesan cheese.